Where can I find the latest PC driver for my Razer Raiju Tournament Edition so I can play Non-Steam games? The Razer Raiju features plug and play support when playing games on Steam. For playing games on you PC outside of Steam please download the Raiju Tournament Edition driver here. My Razer Raiju Tournament Edition has stick drift issues, what should I do? Our support team can help! Please contact us. My Razer Raiju Tournament Edition sometimes doesn’t register in Hair Trigger mode and has some input lag. We have a firmware updater available that can fix that issue for you! You will be required to download it to a Windows PC before you can use it to update your Razer Raiju Tournament Edition controller. Please click here to obtain the updater and complete installation instructions. IMPORTANT: Please note that drivers and updaters for Raiju Tournament Edition is intended for this specific version only and will not work with the older Raiju and Raiju Ultimate. 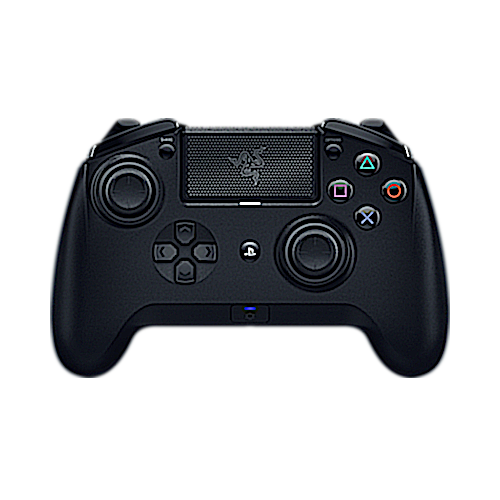 Do I need the Raiju Mobile app in order to use the Razer Raiju Tournament Edition controller? You can plug and play the Raiju Controller on a PS4 or PC with the default settings. The Raiju app is only used to configure the controller’s button mappings and vibration settings if you want to change it from the defaults. Can I use a universal micro USB cable / charger to charge the Razer Raiju Tournament Edition? The Raiju controller requires a customized Razer micro-USB cable for a secure connection and good fit. Razer does not take responsibility for any damage that occurs as a result of using an incompatible micro-USB cable. How can I disable/remove the multi-function buttons M1/M2/M3/M4 on the Razer Raiju Tournament Edition? You can unassign the button mappings of the multi-function buttons using the Raiju app. After connecting to the Raiju app, simply choose the multi-function button you wish to disable, and select "unassign" in the remapping menu. How do I know the Razer Raiju Tournament Edition is charging? When the controller is turned off and switched to Bluetooth mode, the status LED of the controller will be lit red when the controller is charging. When the controller is fully charged, the LED will turn off. I don’t have another controller. What options do I have to be able to connect the Razer Raiju Tournament Edition to the PS4 over Bluetooth? If you do not have any of the above, you can still use the Razer Raiju Tournament Edition controller in USB mode. I cannot see the Razer Raiju Tournament Edition controller in the list of devices on the PS4 when I’m trying to pair. Please ensure your Razer Raiju controller is in PS4 BT Pairing Mode. You can also restart your PS4 and try pairing again. How long does it take to fully charge the Razer Raiju Tournament Edition? The Raiju Controller takes about 4 hours to be fully charged. In Bluetooth mode when the controller is powered off, the status LED will light up red when the controller is charging and go off when it is fully charged. Is the Razer Raiju Tournament Edition Bluetooth 5 compatible? Yes, the controller is compatible with Bluetooth 5 host devices. How many Razer Raiju Tournament Editions can I connect with my PS4? You can connect up to 4 Raiju controllers with the PS4. How do I remove a paired Razer Raiju Tournament Edition from Raiju app? You can simply cancel the reconnection to the controller in the Raiju app. Alternatively, when connected to the controller from the Raiju app, tap on the app menu and select Switch Controller. My Razer Raiju Tournament Edition lags when it’s connected to the mobile app. What should I do? When not configuring the controller, you are advised to close the Raiju app on your mobile device. The Razer Raiju app prompts me to enable Bluetooth when Bluetooth is already on. What should I do? Close the Raiju app, disable Bluetooth on your mobile device and enable it again. Launch the Raiju app. If the problem persists, restart your phone and try again. There are truncated text on the Razer Raiju app. How do I fix this? The Raiju app has font size control to ensure that text appears correctly on the app. In certain cases, however, phones may override the font size control. If font size on your phone is set too large for the Raiju app, they may appear truncated. We recommend that you reduce the font size on your phone such that text are not truncated on the Raiju app. The Razer Raiju app is not displaying the right language set by my phone. If your Raiju app is not displaying the right language set by your phone, ensure that the correct language is chosen on your phone settings, and restart your phone. How many multi-function buttons does the Razer Raiju Tournament Edition controller have? The Raiju has two(2) rear multi-function buttons and two(2) multi-function bumpers. Does the Razer Raiju controller have an audio input/output port? Yes, the Raiju has a 3.5mm audio port for stereo output and microphone input. There is no audio when my headset is connected to the 3.5mm audio jack on the Razer Raiju Tournament Edition. What should I do? Audio streaming through the Raiju controller only works when the controller is in wired mode and connected to the PS4/PC through USB. Ensure that you are connected to the PS4/PC through the included micro-USB cable. If you're connected to the PS4, hold the PS button to go to Quick Menu, then ensure that the volume control for headphones is not muted, and output to Headphones is set correctly. Does the Razer Raiju app use Razer ID? Yes. It uses Razer ID to store your controller profile too. What version of iOS and Android does the Raiju App Support? The Raiju App supports iOS 9 and later/Android 6.0 Marshmallow and later. Can I import/export profiles on the Razer Raiju App? The profile is tied to your Razer ID. Please log in with your Razer ID in the App. Profiles can be saved onboard, but cannot be imported or exported. What comes in the box of the Razer Raiju Tournament Edition? Razer Raiju Tournament Edition Gaming Controller for PS4. Is the Razer Raiju Tournament Edition supported by Razer Chroma? No, it is not supported by Chroma lighting. What does the Razer Raiju Tournaments Edition's Hair-Trigger Mode / Trigger Stops mean? The Trigger stops on the Raiju TE reduce the travel distance of the two main triggers, enabling quick-firing action to deliver the competitive edge. With reduced trigger depth activation, in-game weapon fire or trigger action is executed significantly faster. What are Mecha-Tactile action buttons on the Razer Raiju Tournament Edition? The Razer Mecha-Tactile action buttons provide a unique combination of soft cushioned touch with crisp tactile feedback. How do I change the connectivity mode on the Razer Raiju Tournament Edition? The mode switch is located at the center of the Raiju's bottom side. How do I enable Hair Trigger mode on the Razer Raiju Tournament Edition. How many profiles can I save on the Razer Raiju Tournament Edition. The Raiju Tournament Edition's onboard memory can store 1 profile and an additional 500 profiles in the cloud when you are signed in with your Razer ID. When pairing the Raiju Tournament Edition to the PS4, I get an error message saying that the passkey might not be correct. What should I do? In rare occasions, you may get an error message like this. When this happens, restart the controller pairing process with your PS4. The Raiju app flickers when I change the language or font size from phone settings. What should I do? Restarting the mobile app should solve the issue. Where can I get the latest driver for my Raiju Tournament Edition controller? Can I use my Razer Raiju Tournament Edition on the PC? Your Razer Raiju Tournament Edition controller is fully compatible with any computer running Windows 7 and above. Can I use my Razer Raiju Tournament Edition on Steam as a PS4 controller? Yes, the Razer Raiju Tournament Edition controller is recognized as a PS4 controller by default on Steam. You just have to enable “PS4 configuration support” under Steam settings to use the Razer Raiju Tournament Edition controller on Steam. Can I use my Razer Raiju Tournament Edition on PC games outside of Steam? Yes, you can play most of the PC games outside of Steam with the Razer Raiju Tournament Edition controller by installing the XInput driver here. Please restart your computer if necessary after the installation. I have installed the Xinput drivers from the Razer Website, how do I restore PS4 controller support on Steam? Find "Razer Raiju Ultimate/Razer Raiju Tournament Edition" under "Human Interface Devices"
Right Click and Update Driver. Will the mobile App for the Razer Raiju Ultimate and TE work with the original Raiju? No, the Razer Raiju mobile APP will only work with the Raiju TE and the Raiju Ultimate.